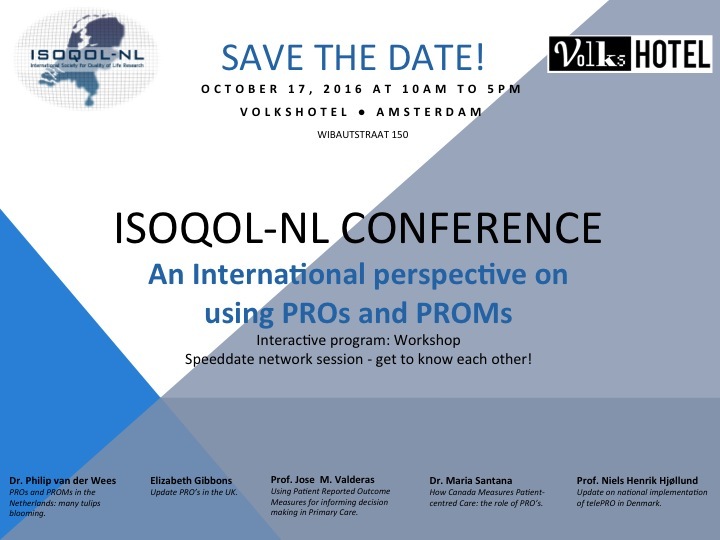 Op 17 oktober 2016 vond het symposium met de titel 'An International perspective on using PROs and PROMs' plaats. Het was een geslaagde dag met goede sprekers en interactieve workshops. Hieronder de sprekers en de presentaties. PROs and PROMs in the Netherlands: many tulips blooming. Senior Researcher Radboud Institute for Health Sciences. Scientific Center for Quality of Healthcare (IQ healthcare). Celsus, academy for sustainable healthcare. Update PRO’s in the UK. Development and evaluation of methods to capture patients experiences of care and health. Senior Research Scientist, University of Oxford. Using Patient Reported Outcome Measures for informing decision making in Primary Care. Health Services & Policy Research Group, University of Exeter, United Kingdom. Clinical applications of PROs in clinical practice; routine collection and feedback of PROs in health care settings; Individualized PROs; Standardized Evaluation of Patient Reported Outcome Measures; Interpretation of PROs. How Canada Measures Patient-centred Care: the role of PRO’s. Methodologist in Patient-centered care and patient engagement at the University of Calgary. Application of PROs in personalized care. PROMIS use in the Netherlands. Associate professor in Clinimetrics, epidemiologist by background with expertise in the development and evaluation of outcome measures.